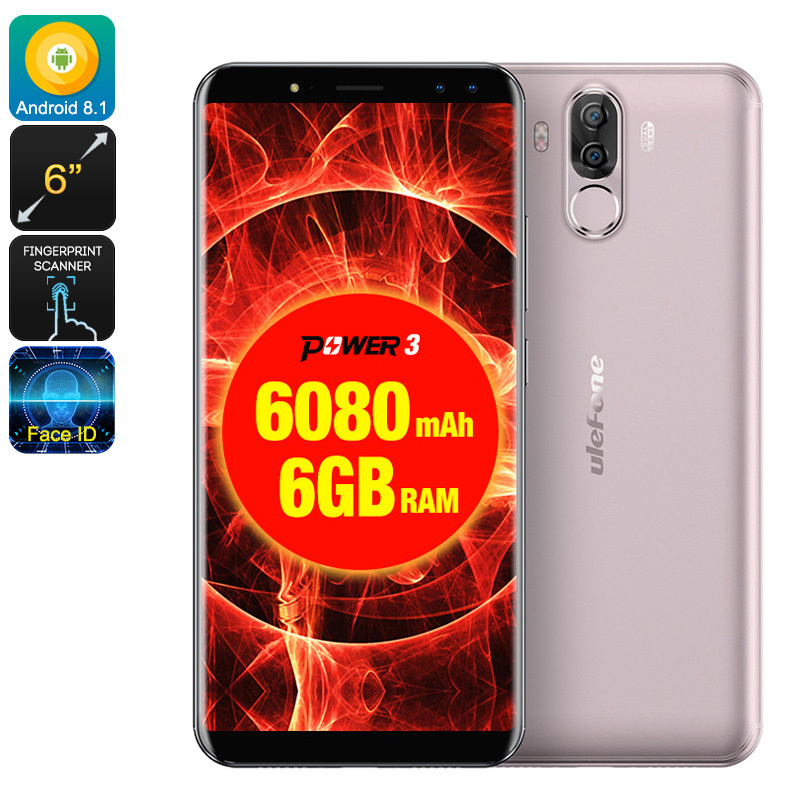 Successfully Added Ulefone Power 3 Phone - 6 Inch Display, 6GB RAM, Octa Core CPU, 6080mAh Battery, Dual Camera (Gold) to your Shopping Cart. An Android 7.1 operating system that can be upgraded to 8.1 for all the latest features. 2.0GHz Octa-Core CPU and 6GB of RAM ensure this phone can tackle any takes you throw at it. 6 Inches display with 2160 x 1080 resolution for the great visual experience. Capture the beautiful moments of your life with a great dual camera. This amazing phone from Ulefone was designed keeping in mind the usage of modern tech users. The Ulefone Power 3 has a long-lasting battery of 6080 mAh, enabling you to play games, watch movies and TV shows without worrying about the battery running down. It can easily last for days on a single charge. This phone runs on Android 7.1 operating system, but it is upgradable to 8.1. This means that you can download all the latest apps and games and enjoy the latest Android OS with all its stunning features. This will furthermore help in optimizing the battery and usage of your phone. The phone is powered by an Octa-Core CPU and has 6 GB RAM. This makes multitasking easy and you can play heavy games without any lag or dropped frames. A 6 Inch display size on the Ulefone Power 3 with a screen resolution of 2160 x 1080 brings a great viewing experience. This bright sharp screen lets you enjoy your favorite media in stunning detail and offers better graphics for games. You won’t need to carry a camera with you to take beautiful pictures. Thanks to the fantastic dual camera of the phone, you can take photographer like pictures. The 21-megapixel and 5-megapixel rear cameras are great for capturing wonderful moments. While the front 13-megapixel shooter lets you take amazing selfies. Now you can take some incredible pictures and movies that you will cherish for the rest of your life. The Power 3 smartphone has a 64 GB of internal storage space that should be more than enough for all you media as well as any photos and videos you've taken. You can expand the external memory by using a micro SD card and add up to 256GB of additional room. This will provide you huge space for saving your favorite shows, movies, apps, games, and much more. Moreover, this phone has Wi-Fi and Bluetooth support making it easy to share your content. You can connect to any wireless network in range and surf the internet. When Wi-fi isn't available there is no need to worry as the phone benefits from the super fast 4G connectivity and brings support for 4G 2100/1800/2600/900/800 frequencies. This Power 3 smartphone from Ulefone product comes with a 12 months warranty. Brought to you by the leader in electronic devices as well as wholesale Android phones and cool gadgets..